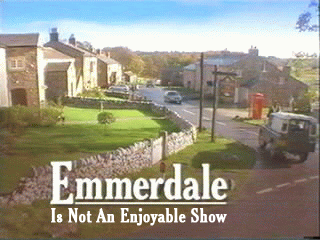 Not only is Emmerdale primarily a soap about old people, it’s about old people in the countryside. I spent most of my teens in the countryside, I already know how mind-numbingly dull it is. I don’t need to wallow away what is left of my already worthless life watching people with beards sit and get fat - I'm already doing that myself, I can just look in the mirror and not waste money on a TV licence.